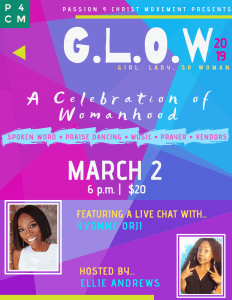 Join the Passion for Christ Movement (P4CM) as we kick off Women’s History Month with our inaugural event, G.L.O.W! This is a celebration of womanhood for every Girl, Lady, or Woman! 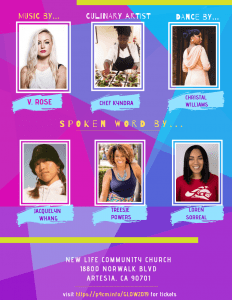 We want to celebrate the contribution of women in the arts, honor ideals of biblical womanhood, support women in the spotlight, and pay homage to the women who have gone unsung! The evening will include an ALL FEMALE lineup of artists, ALL FEMALE vendors, and ALL FEMALE culinary artists providing food for purchase! We want to emphasize the variety of artistic measures that women bring to the table, edify our young women, and embrace one another as sisters in Christ. We will have a very special dialogue with former host of P4CM’s The Conversation, comedienne and actress Yvonne Orji! Musical praise and worship will be rendered by songbird, V. Rose! The night will be hosted by Ellie Andrews of KJLH! There will be spoken word by some dynamic women, praise dance, special prayer, vendors with a variety of Christian apparel, and more! God is going to magnified with a praise only women can raise! Join us for a beautiful evening ladies! P.S. Men, you are invited too *wink*!